With a centuries old history, culture and customs it can only be expected that the things to do and see and exiting Bangkok activities will require more than the usual 2 or 3 days tourists put aside. That might be almost enough for shopping, but if you really want to experience the city to its fullest you are going to need more time. Below we list only a few of the popular attractions to get you excited, but cannot hope to list it all, especially with new man-made attractions added frequently. Yaowarat, better known to us as Chinatown started up in 1782 when King Rama I establish the capital on the eastern bank of the Chao Phraya River. The Chinese immigrants who were originally settled there, in the area where the Grand Palace currently stands, moved out to a strip of land 2 km down the river, the site of the current China Town. It is an ant heap of activity, but with a great selection of street food, bars, restaurants, gold and souvenir shops and simply to experience the atmosphere we suggest you pay a visit. If you prefer to stay nearby we suggest checking out our Bangkok hotel deals in China Town where places like The Shanghai Mansion hotel allow a plush and authentic accommodation experience. Here local merchants have everything on display and for sale from boats laden with products which are ferried along the waterways to the markets. This particular market is a short drive outside the city. 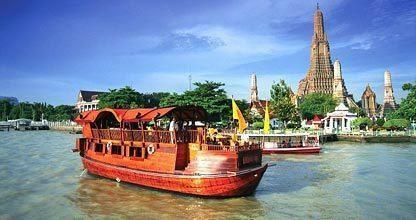 Take a long tail boat along the many small canals and experience traditional Thai lifestyle on the water. 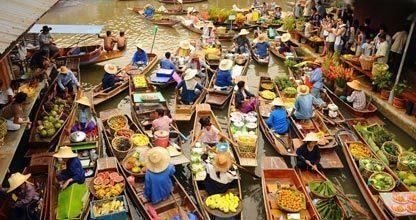 A trip to the floating markets can be arranged with one of the many tourist centres most or with most hotels. Get a different angle of Bangkok from a river taxi and experience what life is like along the Chao Phraya River. You can take the express boat from the river pier right by Saphan Taksin Skytrain station and pass by many sightseeing opportunities and attractions like Wat Arun (Temple of the Dawn) and the Grand Palace. There are several boat tours during the day as well as romantic dinner cruises. Not the official residence of the king, but used for ceremonial purposes The Grand Palace is where the most revered Buddha image, namely the Emerald Buddha can be seen. Tourists boats stop walking distance from the palace and along the way you will pass a market selling food, clothes and crafts. 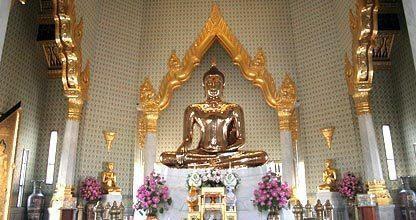 Wat Pho has considerable historical significance. 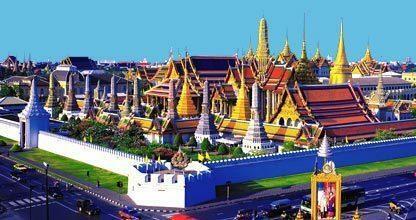 It is the largest Wat in the city and build hundreds o year before Bangkok or Krung The became the capital. 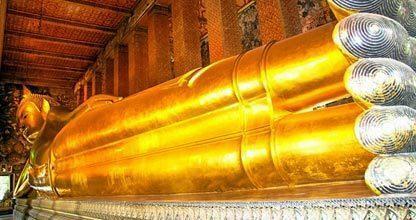 The Wat Pho is also famed for housing the Reclining Buddha, standing 15 meters high. This is a sight that is definitely worth a visit. 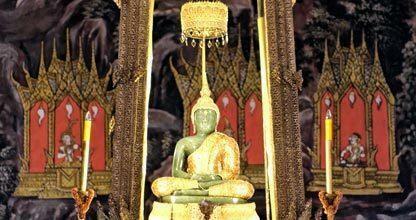 The revered Buddha image inside the Grand Palace is adorned with precious stones and has been around since the 1400's. This 3 meter high Buddha statue is made entirely from 5.5 tons of solid gold, making it the largest solid gold icon in the world. 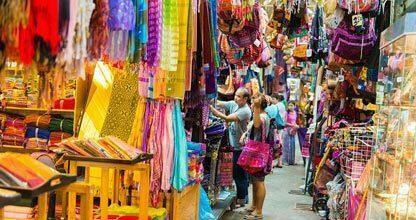 The Chatuchak Weekend Market is the biggest weekend market in the world. There is absolutely nothing you cannot buy here. More than 10 000 stalls or booths covers the market area displaying clothes, jewelry, spices, leather goods, art, ethnic handicraft, ceramic products, furniture and anything else you can think of. Of course, half the fun of shopping in Bangkok for items is the bargaining part. Everything at the markets is negotiable and the vendors will expect you to do so. This children’s water paradise feature an artificial beach and sea, waterfalls, huge waterslides, whirlpools and fountains. There are also playgrounds, an open zoo and botanical gardens. When you have done your shopping and the kids are complaining about the Bangkok heat, arrange a trip with your hotel and go splash around with them, cool down and have something to drink at one of the restaurants. 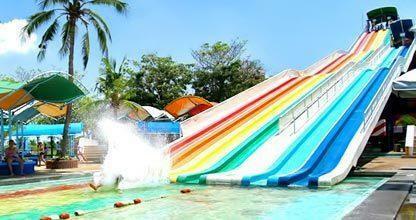 Siam water Park is open daily from 10:00 am to 06:00 pm. 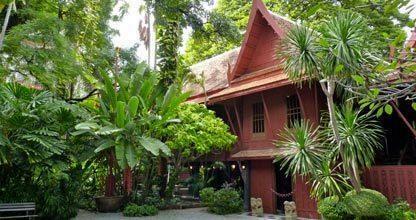 The now museum and former home of American businessman Jim Thompson is as gracious as it is a calm oasis in bustling Bangkok. Jim Thompson started the Thai silk industry after World II. The teak wood house itself is constructed in 6 styles representing the architectural styles of the different regions in Thailand and filled with interesting historic artifacts. 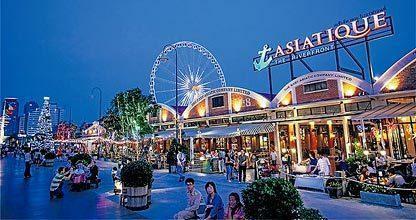 New attractions include the Asiatique riverside complex with restaurants, shops and cabaret shows. At the terminal 21 complex in Sukhumvit Road are life size representations of world cities and you can also visit the Bangkok Dusit Zoo, several museums, the snake farm and crocodile farm. Tours of can be arranged via your hotel or one of the many tour centers.